The Market Hall – The Metropole Theatre. I don’t know when the original Market Hall was constructed though I have seen it listed as a venue as early as the early 1880’s. It was featured on old maps but I have never seen or heard of any images of the building. 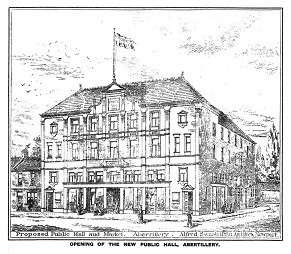 The Abertillery Market and Public Hall Co Ltd. In January 1885 a company was set up to build houses and a new market hall, the new company was the Abertillery Market and Public Hall Co Ltd. It was registered on the 19th January 1885. The subscribers were – Mr W. Morgan, Abertillery Grocer; Mr W. P. Thomas, Abertillery Accountant; Mr L. R. Rogers, Abertillery Grocer; Mr W. M. Price, Abertillery; Mr J. Samuel, Abertillery Accountant; Mr F. Morgan, Pontypool Merchant; Mr H. P. Fikitel a Newport Builder: The company didn’t seem to achieve much and no more information could be found on them. The Abertillery Market Hall, Land and Building Company Limited. In January 1891 the new Abertillery Market Hall, Land and Building Company Limited was initiated. In December 1891 the Abertillery Market Hall, Land and Building Company Limited was registered with their offices at 54 Cwm Street, Abertillery. Mr J. R. Webb; Mr J. E. Webb; Mr Jas Yendoll; Mr L. R. Rogers; and Mr Jas Samuel Directors: Mr J. A. Shepard Solicitor; Mr J. T Baker Secretary; Mr W. B. Harrison, Abertillery and Mr Theodore Vachell of Newport a large share-holder. The first meeting was held to discuss the draft agreement for the sale of the old Market Hall with all goods and chattels. The Reconstruction of the Market Hall. The new company stated they intended to entirely reconstruct the present old hall. It would be extended on all sides and built over the foundations of the original building. They stated that there has never been any performer that had appeared in the old hall that had came from there without complaining about the decrepit state of it and to even try to secure any good artistes for a first class concert was out of the question. The new company said they would pay from 8 to 10 per cent towards the building of the New Market Hall. On June 14th 1892 the Market Hall Company had a meeting and they decided to accept the tender of Mr A. P. Williams to erect a new Market Hall, Abertillery, with shops and offices at Market Street, Abertillery at a cost of £3,750. They stated the work was to commence at once. On Monday July 11th 1892 the demolition of the old Market Hall began. The last public meeting held at the old hall was the demonstration held by the Liberal M.P. Mr Warmington, he had earlier been booked to speak there and has he attended and gave an oration the builders were outside erecting the scaffold. The stall holders were given spaces on near-by land owned by Mr Owen at Commercial Street. The contractor was Mr A. P. Williams. The architect was Mr Alfred Swash, M.S.A. On Tuesday 14th March 1893 the annual meeting of the Market Hall Company was chaired by Mr G. B. Hammond; Messrs Jas. Samuel (Aberbeeg) and Mr L. R. Rogers were re-elected and Mr W. P. Musitano (Aberbeeg) was re-elected as auditor. The Official Opening of the New Market Hall. On Wednesday 6th September 1893 the new Market Hall was officially opened. The new Market Hall was constructed over the foundations of the old Market Hall building at Market Street, Abertillery. The final cost of the construction was totalled up to £4,000. It was advised to have the main exterior walls rendered with Portland cement. On the front and side portions on the ground floor were lock-up shops and offices, a balcony for poultry and dairy produce was arranged over the shops. The back portion was utilised for a committee room. The hall occupying the ground floor, was a spacious room which together with the balconies afforded accommodation for about 1,250 persons. The interior was decorated and the scenery on the stage, painted by Mr Quick, the scenic artist of Cardiff. The hall was provided with heating apparatus on the high pressure principle, supplied by Messrs Hampton, Limited of Abergavenny. There were ample provisions for entrances and exits. The Market Hall Company said the contractor Mr A. P. Williams performed in a thorough manner and that it was gratifying to know that there was no need to go out of town for a builder, to erect the largest and most important building in the Western Valley’s. A concert was held on the opening evening, the hall was fully decorated by Messrs Morgan & Francis of the Pontlottyn Shop, Abertillery. At 8.00pm the concert was opened by Miss Llewela Davies with a pianoforte solo her reputation was a very high one, being the possessor of eight medals, besides winning 3 scholarships and two exhibitions. Songs followed by Mr William Evans; Miss Weasley accompanied by Mr J. Collier on the violin; Miss Mary Thomas; Mr Evan Evans; A harp solo by Miss Weasley; Miss Florence Armriding; A duet by Messrs W. and E. Evans; Miss Thomas ended the first part…… Second half was began by Miss Llewela Davies with a pianoforte; Miss Florence Armriding; Mr William Evans; Miss Rosa Tilney; Mr E. Evans; A harp solo by Miss Weasley; Miss Mary Thomas: Finally the National Anthem was sung by the quartet on stage. The Metropole Opera House and Theatre. In 1900 the new Market Hall was officially renamed The Metropole Opera House & Theatre. There was a “Grand Opening Night” held on Monday September 17th 1900, The first performance was the drama “The Gamester Of Metz” a romantic French drama by Mr Charles March. Starring Mr Charles March and Miss Marie North. The story of a French sergeant of the 17th Guards, he played Mr Paul Baldot and (Mr March) was a recognised quick change artiste, the stage has known, during the third act he went through 14 different changes in 50 seconds. In 1909 the Metropole Theatre followed many other public buildings and catered for the growing trend of roller skating. The hall was equipped with a roller skating rink and Mr C. J. Seabourne was the proprietor. In September 1912 the “Stage” newspaper published an advertisement on the Barto Brothers. The Barto Brothers had appeared at the Metropole Theatre, Abertillery the previous week. The comedy duo included Mr Arthur Stanley Jefferson (Stan Laurel), they began a tour as the Barto Brothers with a show called the “Rum’uns of Rome”. They later toured the United Kingdom and performed at Abertillery (as seen above). The tour didn’t go down too well and Mr Arthur Stanley Jefferson was offered a place back in America, he accepted and returned to the States in October 1912, became known as Stan Laurel and the rest is history. On Monday May 19th 1913, a Kinemacolor movie documentary film was shown at the Metropole Theatre. The documentary was shown over six nights and featured – The Delhi of Dunbar, the Investiture of the Prince of Wales at Carnarvon, the construction of the Panama Canal, a visit to the Pyramids, scenes of Flowers and Animals, Military scenes, the Balkan War and Comedy and Dramatics. The film was classed as educational and was a first of its kind shown at this time. The colour movie concept was introduced in 1902, it was a sort of hand tinted method. In 1908 the Kinemacolor Kinematograph was invented by George Albert Smith UK 1864-1959. The design was a clear revolving disc with two transparent colour segments of red and green rotating in front of the camera lens giving the effect of a colour film being projected onto the screen. That wasn’t bad for Abertillery considering it would take another twenty-four years for the colour film industry to take off. 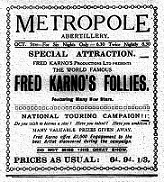 On October 5th 1925 Mr Fred Karno came to the Metropole for six nights with his special attraction the Fred Karno’s Follies. This show was part of his “National Touring Campaign” which featured a prize – Fred Karno offered £1,000 engagement to the best artist discovered during the campaign. Over the years the Metropole stayed an important venue, a Market, Lecture Hall, Cinema and Dance Hall etc and has been renovated and refurbished on many occasions. There were rumours that Charlie Chaplin performed there but again as with all other reports revolving around Mr Chaplin visiting the Abertillery Music Halls it’s just rumour and not true. Though as seen above, the great Stan Laurel may have treaded its boards! Points of Interest – Mr Alfred Prosser Williams. A. P. Williams was one of Abertillery’s largest and most well known building contractors. He was born on 25th March 1849, he was responsible for rebuilding St Michaels Church, the Market Hall, the Globe Hotel, the Abertillery Vicarage, Church Street, he built the Co-operative in Church Street, Blaentillery School, Queen Street School, Arael School, along with many other buildings and also rebuilt the Globe Picture House at Blaina. He was the first person in Abertillery to have a private telephone installed in his residence Gwentland House, Oak Street, Abertillery. Upon his retirement he went to live at Herbert Hall, Crickhowell, he later came back to Blaina to supervise building work and whilst doing so lived at “Lismore House” New Bennett St.
Mr Alfred Prosser Williams sadly passed away in 1932. Mr Williams mother was a direct descendant of the Vaughan’s of Tretower Court Crickhowell also Davy Gam who was killed at the battle of Agincourt in 1415, and Knighted on the battlefield by King Henry V. Sir Davy Gam was a Llewellyn by name and was descended from the Herbert and Vaughan families.